And if you are by your computer, Matt Jorgensen is leading a group tonight at Smalls in New York City featuring Thomas Marriott (trumpet), Wayne Escoffery (saxophone), Orrin Evans (piano) and Joe Martin (bass). You can watch is live online by clicking here. She’s got a new album coming out soon (“Standin’ on the Rooftop”), and what better way to launch it than with a tour that begins in Seattle? The merveilleux Madeleine Peyroux, she of the languorous voice redolent of smoky Parisian nightspots of yore, visits Jazz Alley with her combo and a cache of tunes old and new. On the song list no doubt will be cuts from her latest, “rootsier” disc, which includes a song by Lennon-McCartney and material by Peyroux herself. 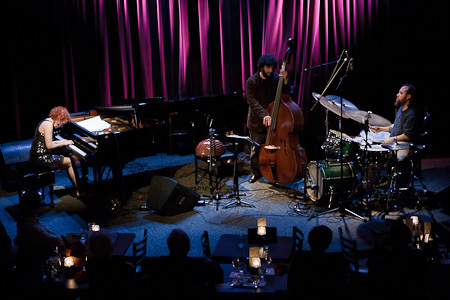 Thursday-April 2 at Jazz Alley, 2033 Sixth Ave., Seattle; $36 (206-441-9729 or www.jazzalley.com). 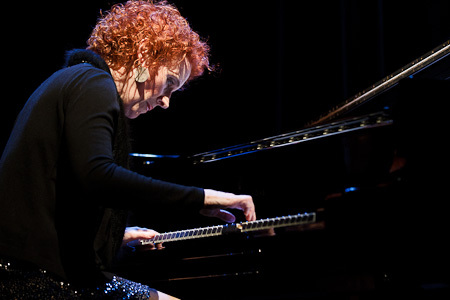 Tickets are now on sale for the 2011 Ballard Jazz Festival which runs April 20-23. Pre-sale tickets are discounted, with the largest discount available to those who purchase before April 1 (Friday). Click here to visit the Ballard Jazz Festival website. 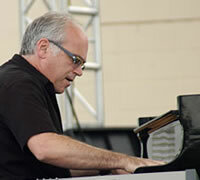 This year’s festival is headlined by pianist Mitchel Forman and his quartet, featuring Chuck Loeb, Kevin Axt and Marvin “Smitty” Smith, as well as the East-West Trumpet Summit featuring trumpeters Ray Vega and Thomas Marriott. Rounding out the schedule is The Ballard Jazz Walk, Swedish Pancake Jazz Brunch, Brotherhood of the Drum and Guitar Summit. from Earshot: The Seattle Jazz Composers Ensemble presents the first of three concert programs for the 2011 season: Jazz Impressions of Classic Video Game Music. The concert features arrangements by composers Andrew Boscardin, Evan Flory-Barnes, Nate Omdal, Michael Owcharuk, Josh Rawlings, and Charlie Smith – large ensemble works written for 17-piece big band, featuring music from Metroid, Kid Icarus, Super Mario Bros., Castlevania, and Street Fighter 2. 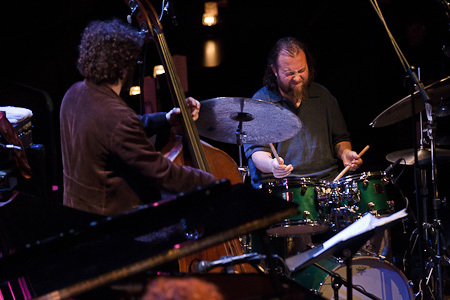 The Seattle Jazz Composers Ensemble (SJCE) exists to create and perform new compositions by Pacific Northwest composers and arrangers while providing sustainable opportunities for continuing education and work advancement for professional musicians. Within this context SJCE strives to provide the public with unique, compelling community events at the lowest cost possible, integrate cross-disciplinary elements to transcend the traditional concert format, showcase Pacific Northwest composers and musicians on a national level, and channel public and private funding directly into the hands of artists for their work. Their presentation of the music of classic video games is a family-friendly concert at University Prep Founder’s Hall (8000 25th Ave NE), March 25. Admission is $15 general, $8 students and seniors. More information at www.seattlejazzcomposersensemble.com. 8:00 PM; $5 – $15 sliding scale at the door (cash/checks only). Chad McCullough is one of the busiest trumpet players on the NW scene. He’s released three albums in the last two years under his own name, is a member of the Kora Band, and has toured several of his projects throughout Europe, Canada and the US. Tonight McCullough presents his new project, performing on effected trumpet in a trio with pianist Wayne Horvitz and a special guest. Saxophonist Brent Jensen and guitarist Krispen Hartung have collaborated together for years, and this concert will bring pianist Bill Anschell into the group, expanding the dynamic interplay between the musicians. Jensen, a frequent face in the NW jazz scene, has released a duo record with Anschell (We Couldn’t Agree More, Origin 2009). Hartung has been actively involved in the Boise music scene for over 20 years, and is founder and artistic director of the Boise Creative and Improvised Music Festival. Bill Anschell has played and/or recorded with a host of jazz greats including Richard Davis, Ron Carter, Benny Golsen and Russell Malone. It’s that time of year again — the Golden Ear Awards, annual praise night for the Seattle jazz community. The balloting is over, but you can still enjoy crowning the winners while listening at Tula’s to the estimable bassist Chuck Deardorf, who’s bringing sizzling Portland alto saxophonist Warren Rand up for the occasion. 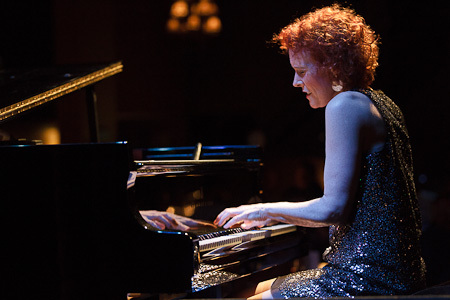 The rest of the quintet features Dawn Clement (piano), Dave Peterson (guitar) and Gary Hobbs (drums). There were some strong candidates this year. Deardorf is up for a well-deserved Seattle Jazz Hall of Fame award and, for best album, the nominees span nearly a century, from the crisp young lions of Seattle’s Speak to 84-year-old veteran saxophonist Jimmy Heath, with the Seattle Repertory Jazz Orchestra.